We have a new high temperature Dual Input Digital Pyrometer available. This Pyrometer comes with a Type K thermocouple(7 1/4" long) and mounting block, 5 feet of thermocouple wire, and a pyrometer flange for mounting the thermocouple to the kiln. 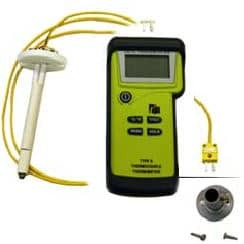 The Pyrometer comes with a case that can be mounted to the wall or it has a flip out back that can be set on a table. Since it is "Dual Input" you can purchase an additional thermocouple package and monitor two kilns. It even remembers the minimum and maximum temperatures recorded in a firing. It is rated to Cone 10 with a plus or minus 0.4% of reading accuracy. A pyrometer flange for mounting the thermocouple to the kiln. It even remembers the minimum and maximum temperatures recorded in a firing. It is rated to Cone 10 with a plus or minus 0.4% of reading accuracy.